Located just 7 km above overlooking the town of Almora in the Kumaon Himalayan region of Uttarakhand (North India), AyurVAID Kalmatia is set atop an opulent hilltop is a 14 acre spread of greenery, dotted with comfortable cottages and facilities that spell serenity and cure. Almora is the first British hill station established in 1815. Till today we still have an interesting blend of British colonial and Kumaoni architecture..Kumaon lies at the feet of the tallest Indian mountains, Nanda Devi 7816m, Kamet 7756m, Chowkhamba 7140m, Trishul 7120m, Mrigthuni 6855m, Nanda Kot 6860m and PanchChuli 6903m, making it the most attractive mountain destination in all Indian Himalaya and closest to reach from Delhi. This region has been a confluence where cultures have blended together, leaving behind an infinity of architectural and archeological wonders: Jageshwar temples, Katarmal Sun temple (one of few in India after Konarak), prehistoric rock art, charming local villages set amongst spectacular valleys and green terraced lands. AyurVAID Kalmatia is a wayside station to a huge variety of indigenous and migratory birds with occasional visits from pine martens, foxes, porcupines, wild hares, jackals and the elusive leopard!Just outside this healing destination, a road leads to Binsar Wildlife Sanctuary, and a short drive away is the ancient temples at Jageshwar and Dandeshwar, the Katarmal Sun temple and Binsar Wildlife Sanctuary. 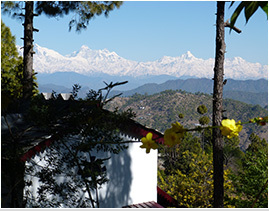 Also within easy reach are the hill towns of Kausani, Nainital and Ranikhet.